According to a new report from GottaBeMobile, customers who purchase the new iPad and sign up for a 4G data plan with Verizon will receive mobile hotspot functionality at no extra cost. The iPad wireless hotspot feature allows you to use your iPad 3 as a Wi-Fi router, feeding signal that can be used to access the internet on other wireless enabled devices such as smartphones and laptop computers. 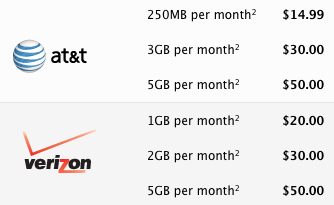 AT&T have released their pricing structure for iPad 3 data plans but are yet to make official comment on whether these prices will include the ability to use the iPad as a mobile hotspot. As announced on March 7, every new iPad is able to act as a mobile hotspot, but it’s a carrier-dependent feature. With the iPad 2 and iPhone 4S, several networks chose to offer the service for an extra monthly charge and it is expected that the same charge may apply to some iPad 3 data plans.